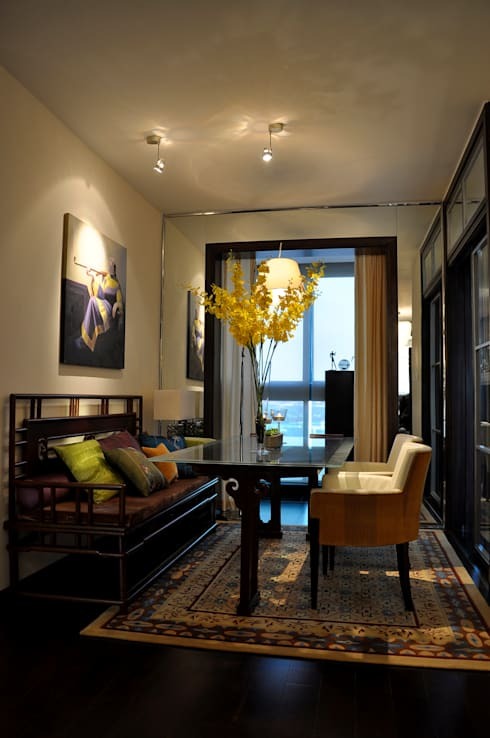 The amazing home we're touring today is located in China's largest city, Shanghai, and brings together the imaginative, opulent and eclectic taste of Mr Ivan Cheng, director of Ivan C. Design Limited. Some years ago, while on a business trip to Shanghai, Mr Cheng became fascinated by the city, with its unique charm and multiculturalism inspiring what he calls his 'Shanghai dream'. The result has been the design and production of this tranquil home, situated within the hustle and bustle of the one of the world's most populous locales. Walnut comprises the primary material for decoration, with the wood's dark tones brightened by yellow walls and other bold colours such as green and purple. The decoration within the space effortlessly combines European and Chinese design, reflecting Mr Cheng's appreciation of both cultural aesthetics. Antique pieces are interspersed with more modern furnishings, extending the eclecticism within the abode from a cross-cultural blend to one that also encompasses a spectrum of design history. This home is absolutely inspiring in that it gives the perfect depiction of the complex and contrasting taste of its designer, who draws inspiration from Hans Christian Andersen's classic quote Just living is not enough. One must have sunshine, freedom and a little flower . Take a tour below and see what you think! Opulent eclecticism seems to characterise this amazing abode, which blends elements of both Chinese and European design to create a fascinating ambience. In the living room for example, the focal point is this stunning, European-style fireplace, with the glorious gold of a decorative mirror drawing our gaze from atop the mantle. The sheen of soft light bouncing off its lines and curves is almost hypnotic as the piece provides a bold celebration of the sun, with the mirror's beams flowing downwards to warm 3 humble pot plants below. Behind the fireplace we can see an exquisite cabinet in Chinese style, which adds another intriguing decorative element within the space, creating a point of interest as we flow through to the dining area of the home. 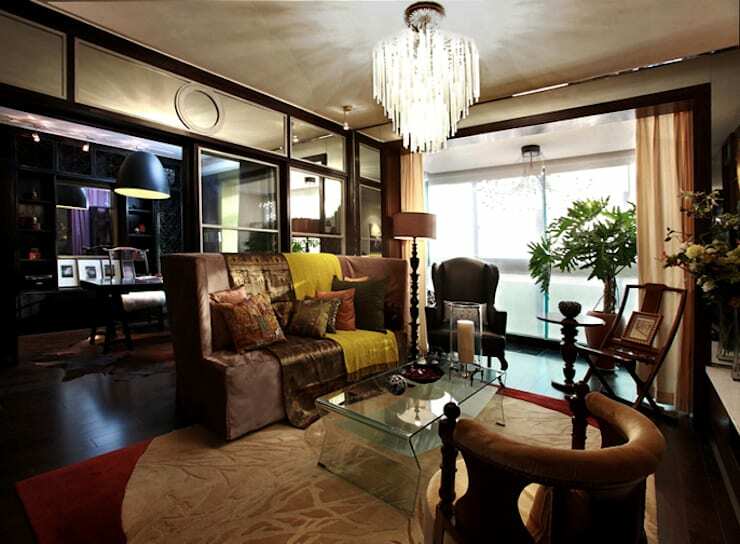 A diverse array of furnishings decorate the room, from the high-backed sofa emulating classic Asian design to the more modern leather armchair and contemporary, glass coffee table. The space beautifully showcases the complexity of the designer's personality, with styles spanning antique to modern and materials ranging from silk and crystal to leather and leafy foliage. The deep tones of the dark, wooden floors are balanced by the pale ceiling, the soft sunlight flowing through the large windows, and the delicate glow of a majestic chandelier. The dining area is intimate and elegant, with the setting comprising a contemporary glass table and comfortable, modern seating opposite a Chinese-style Master Chair. The intricate design of a thick rug adds to the comfort and elegance of the room, brightening the space alongside colourful cushions and the lively, yellow flowers atop the table. Directly above the dining setting is a painting from the 'Smoking Women' series by Liu Baijun—one of the hottest artists in today’s Shanghai. The painting, with her idle feeling, adds to the tranquility of this quiet room. 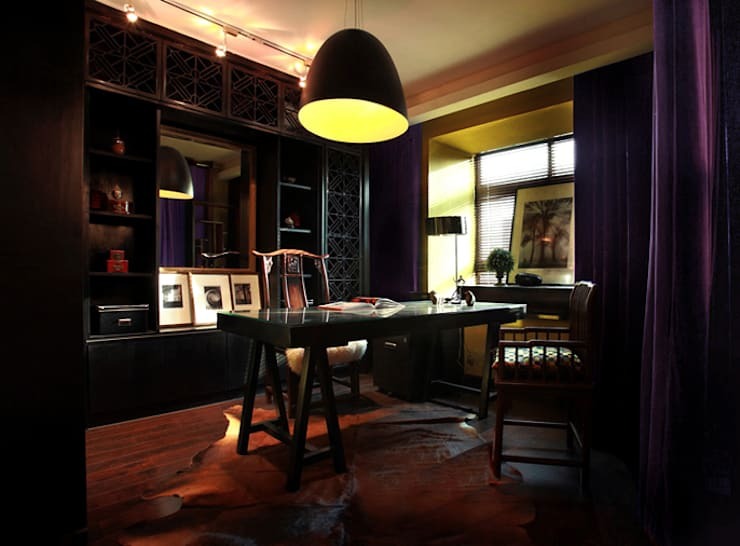 The office space rests in darkness relative to the remainder of the home, due to the deep tones of wood finishes seen throughout the walls, floors and furnishings. A leather pelt is strewn across the floor, adding a masculine feel to the room alongside the fur trim warming an antique armchair from China's Qing Dynasty (1644-1911). The cabinets at the rear of the office stand in quiet stoicism, and are decorated both with intricate latticework and an array of Asian objects, enhancing the sense of history within the space. 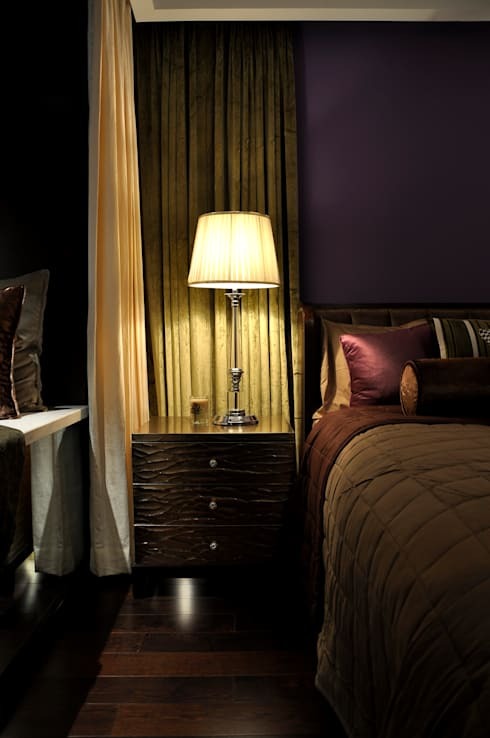 Deep, purple curtains shroud the study in majesty, with soft light filtering through the windows to mingle with the warm glow of the overhead lamp and spot lighting. The master bedroom within the home retains all the elements of eclectic opulence, with the bed draped in quilting and cushions, ready to accommodate indulgence and blissful sleep. The warm purple of the walls adds another sense of traditional majesty, and is beautifully balanced by the light gold of the curtains which flow around the bed. The ripples of an impressively carved bedside table glow beneath the soft illumination of a classic lamp, with this space representing the ultimate in elegant, eclectic luxury. For ideas to include a touch of opulence in your home have a look at homify's Essential guide to choosing a chandelier! 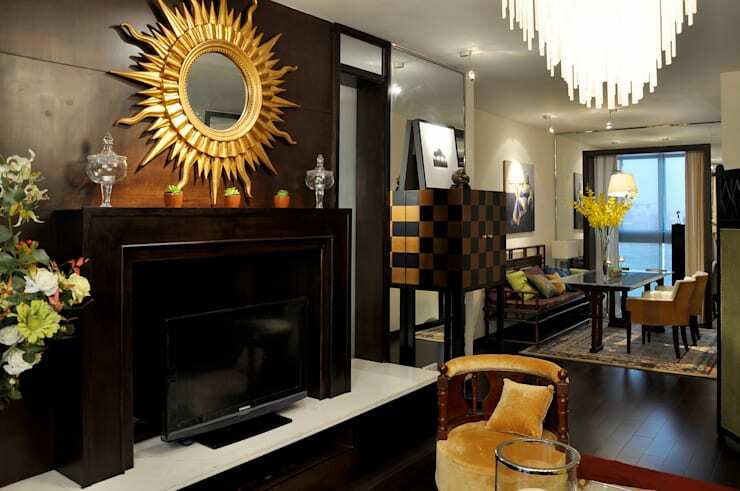 What do you think of the eclectic blend of styles and decoration seen here? Tell us below!